To be added to our mailing list please enter your information in the form below. You will receive our Art Calendar and four Central Magazines annually (Tishrie, Chanukah, Purim/Pesach, Summer), along with reminders for upcoming programmes. There is no fee to be on the mailing list. Donations are appreciated and help us to continue and to grow in our vital work. Please select the areas of interest for which you would like to receive Mail / Email / Texts from us. Please provide your information here. Items marked with an * require a response for sign up. 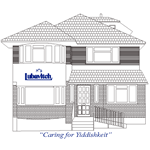 Please note: All information submitted to Lubavitch of Edgware is strictly confidential. we do not share this information with anyone or any organization.